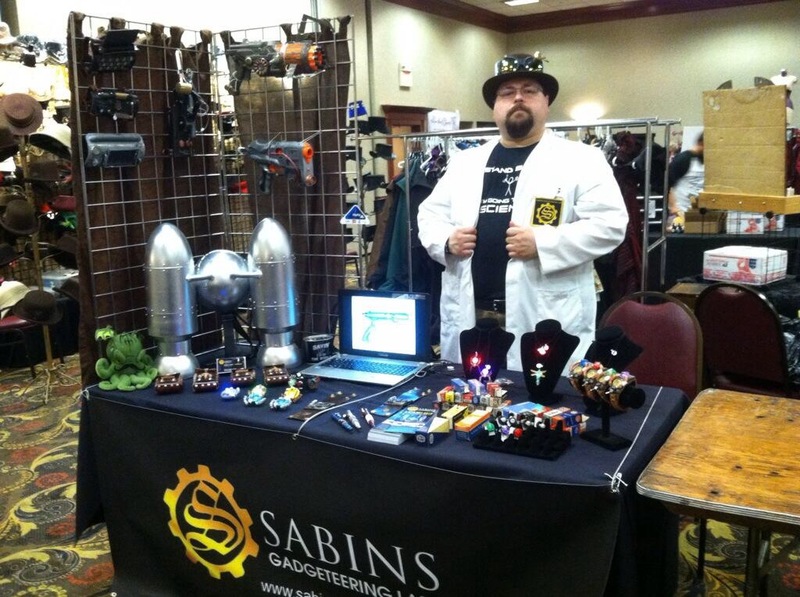 “I have been attending science fiction/fantasy/horror conventions almost since the phenomenon started, but I was finding it difficult to do interesting costumes after a while. I could not really pull off the “green slave girl” any more and I had done every female companion to Dr.
You’ve heard form a variety of Steampunk visual artist as to why they went Steampunk, now readers, it’s your turn. 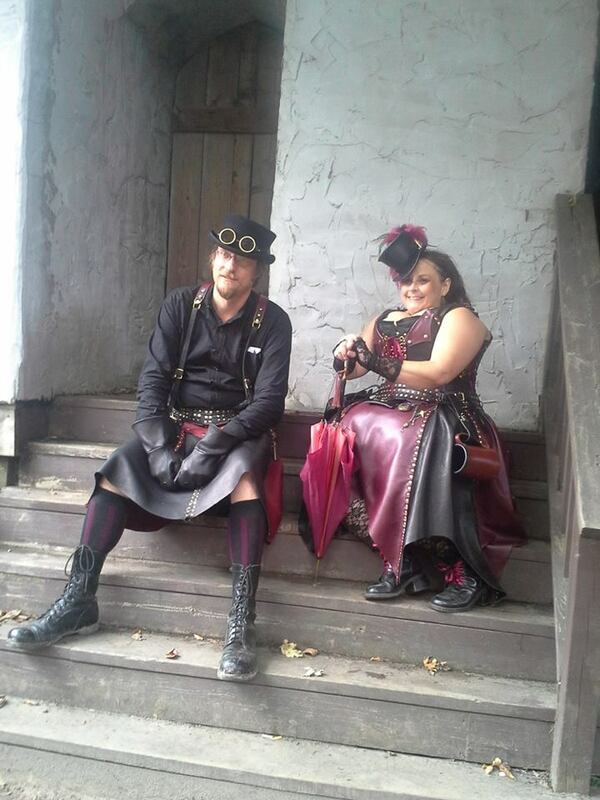 Please comment below…Why Steampunk? Feel free to share why you write or read Steampunk? Maeve Alpin, who also writes as Cornelia Amiri, is the author of 19 books. She creates stories with kilts, corsets, fantasy and happy endings. Her latest Steampunk/Romance is Conquistadors In Outer Space. She lives in Houston Texas with her son, granddaughter, and her cat, Severus. Today we welcome M. Holly-Rosing. M. Holly-Rosing is the writer/creator of the webcomic BOSTON METAPHYSICAL SOCIETY. You can read the comic as well as buy the companion novellas (Kindle, Nook and Smashwords) and the print edition through the website. Her short story THE CLOCKWORK MAN (A Boston Metaphysical Society Story) was published in eSteampunk Magazine (February). Another short story THE WAY HOME (A Boston Metaphysical Society Story) will be published in September as part of a comic anthology with Atomeka Press. 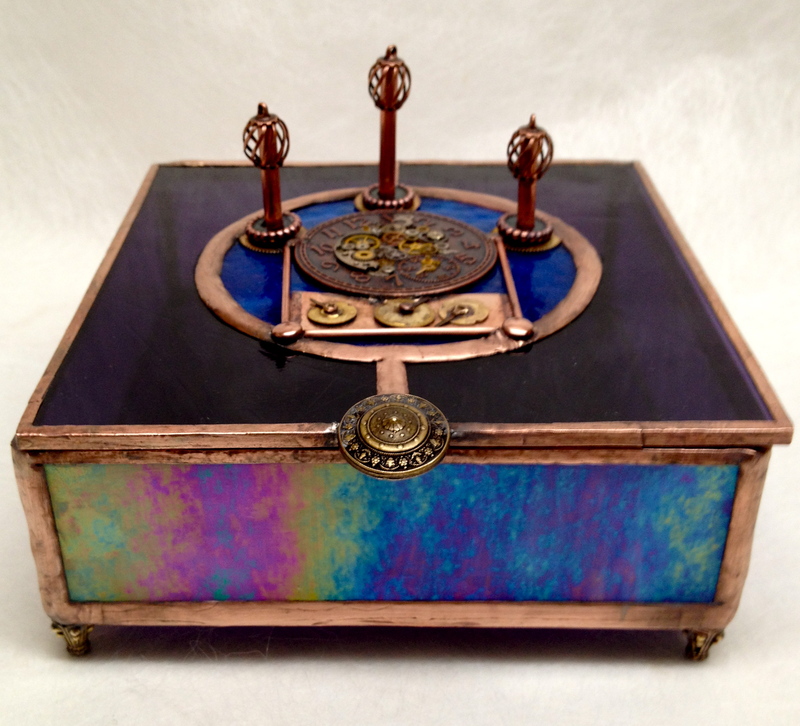 What is it about steampunk and clocks? Where ever you look you see time pieces and their requisite gears churning away reminding us of the inevitable march of time. It is a curious thing really, to be able to see seconds slip away on a mechanical device. The astrolabium is a wonderful example of literally watching seconds, days and months pass by. Pre-dating this gorgeous mechanism, ancient Greek astronomers had developed a device to determine the position of the sun and stars. However, the astrolabium does more than simply count off hours, minutes, months, and dates. It gives time beauty and substance in an existential kind of way. 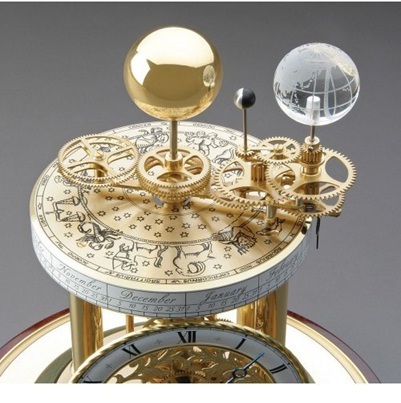 Designed by the famous clockmaker Philipp Matthaus Hahn (1739-1790), its origins and/or inspiration can be attributed to the tellurium clock, the Antikythera Mechanism of the 2nd century B.C. and possibly many others. (Creativity and inspiration often seep across national boundaries and flourish in unexpected ways.) Whatever its origins, the astrolabium uniquely reminds us of the passage of time with a miniature globe of the earth that rotates and revolves around a solid brass sun in this particular model. Though it is beautiful, I find it rather annoying. I mean the part about watching your life slip away. But you see I have always liked clocks. Pocket watches, necklace watches, the old mantel piece clocks that once were so fashionable in days gone by. I love to see the inner workings of clocks and watches for the simple reason I find the craftsmanship to be extraordinary. And it’s just so damned pretty. If I had enough room in our house there would probably be clocks everywhere, but practicality won out and in their place are stacks of books. One of my fondest memories as a child was to hear my grandparents’ grandfather clock chime in the early morning hours in their home in Oregon. I knew my grandfather would be up soon, but I didn’t have to get up yet. So I’d snuggle in until the smell of coffee would waft up the stairs. By the time I dragged myself out of bed, I knew my grandfather would have decided what needed to be fixed that day. For a child it brought stability, love and all the good things one hopes for in life. And it all started with a clock. 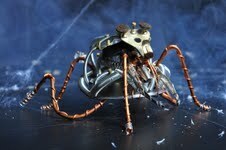 So, what is it about steampunk which finds clocks so enticing and engaging? And not just any type of clock, but ones where their inner workings are exposed for all the world to see and dissect. 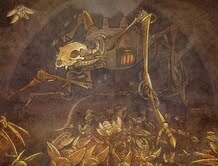 It is my belief that in steampunk clockworks are a representation of the human heart. Its ticking is the equivalent of a heartbeat. Its exposure a symbol of human frailty. Gears can falter, skip and even grind to a halt. 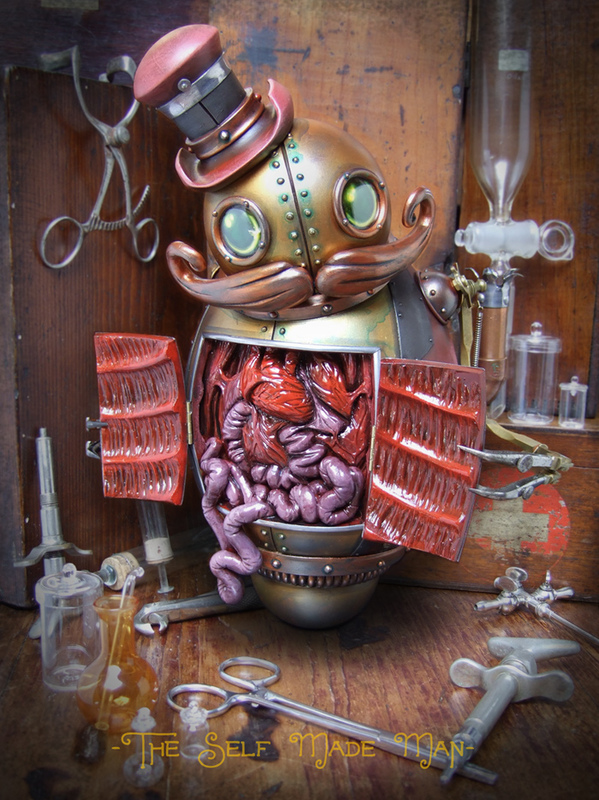 The human condition all wrapped up in a mechanical device. 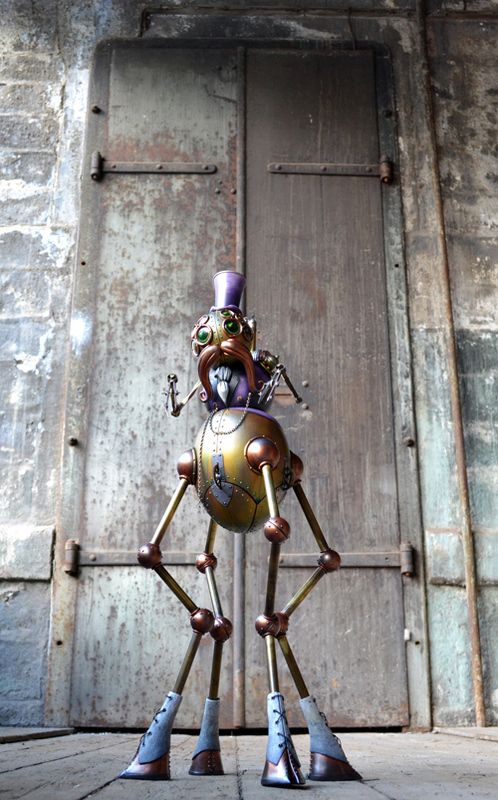 Steampunk has imbued clockworks with soul and a sense of purpose beyond the intention of their original makers. You know the old saying, “you wear your heart on your sleeve?” In this case, it’s on the wall, in your pocket or in the palm of your hand. And it can be crushed at a whim. Clocks and time play a very large role in steampunk. Loosely based on Victorian England sensibilities and technology, steampunk looks to the past for a new vision of the future. 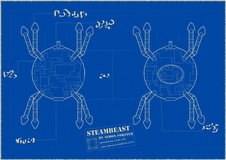 For the uninitiated, you will see steam-based technology augmented with modern devices in steampunk fiction as well as fashion and home-built gadgets. Some make sense, others not so much. But that’s part of the fun. Fashion is often ripped straight from Victorian styles, though more often than not the person wearing it has given it their own individual flair. 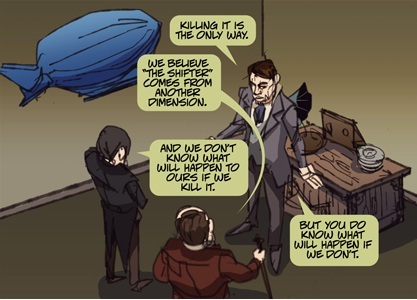 As the writer/creator of the webcomic and companion novellas for BOSTON METAPHYSICAL SOCIETY, I worked within the framework of a specific time and place, but since I was working in fiction I had the opportunity to take a more modern point-of-view towards science and social mores. It was challenging and rewarding. The challenge being making sure my time line made sense. The reward was when it all worked out. Though I do not have any visible clocks in the webcomic, there is however, a “ticking clock” which lurks in the background. A “ticking clock” in the writer’s world means your protagonist must accomplish something in a specific amount of time or something bad will happen. In this panel from the second chapter, Samuel has met with B.E.T.H. to discuss what to do about “The Shifter,” a trans- dimensional being who has been killing people at an ever growing rate. Their job is to stop it before it kills again. The theme of clockworks in steampunk not only suggests the inner workings of the human heart but as I mentioned before evokes another time and place. And in some cases, those times and places cross over in the most unusual way. 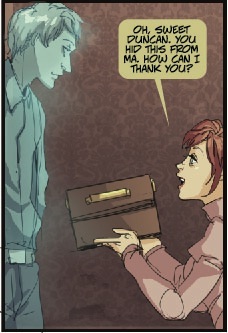 In this panel from the first chapter of the webcomic, Duncan, who is a ghost, had hidden a camera from Caitlin’s vengeful mother. He has crossed over from another time and place to help someone he cares for. 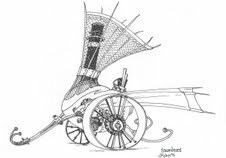 Since clockworks and time are inexorably linked, steampunk does what it does best in demonstrating another vision of the past with influences of the future. In this panel from chapter two, the men of B.E.T.H. are on a hill overlooking Boston Harbor. It is an image of an alternate history where dirigibles are common place along with a modern looking steamship which cruises into harbor. I have been a huge fan of science fiction and fantasy since I was a kid, but I was not introduced to steampunk until a few years ago by a dear friend. (I owe him one.) BOSTON METAPHYSICAL SOCIETY has been my first venture into steampunk as a writer, but I have funny feeling I may have found my home. It allows me to explore the issues and themes which are important to me in a way that appeals to my own personal aesthetic. For when you strip away the gadgets and the fancy clothes you discover that in steampunk, time is always at the heart. Today we welcome Ray Dean! A reenactor and educator, Ray Dean has delved into many eras of the past, but Steampunk speaks to her in a retroactive futurism that opens so many possibilities. Her blog, My Ethereality(http://raydean.net), explores history, culture, war and love in eras and countries that might influence a Steampunk world. Ray Dean: Is The Dark Victorian: Risen your first novel? 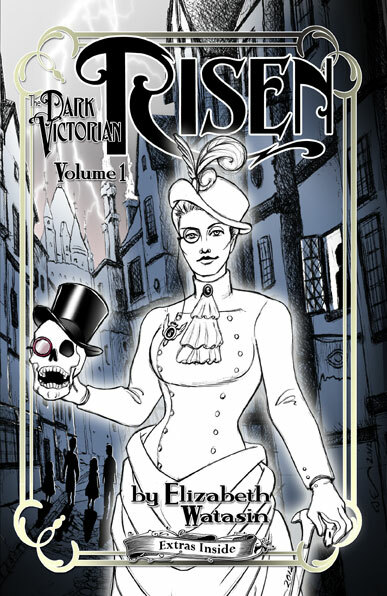 Elizabeth Watasin: Dark Victorian: Risen is my first long prose narrative, yes. Before, I’d only had published comic book scripts, like for Disney Adventures Magazine, and for my own created works, one being Charm School, which was published by SLG Publishing. RD: You’re an artist in many ways. You’re the author of the novel, the illustrator… what other roles do you play? EW: Since making the commitment to self-publish, I find myself also taking on the role of typesetter, which is the person who lays out a book for print format. This requires learning some basic aesthetics that we, as readers, all take for granted, like the measure for margins, the limits on font use, how to lay chapter titles and blocks of text aesthetically, and so forth. I have a great traditional typographer who hand designs my book logos, but I’m usually the one who lays out that lettering for the covers too, so I’m also doing some graphic design. Then as publisher, I must do the business aspects, like acquire ISBNS, have the book properly entered at Bowkers, the Library of Congress, apply for copyright, and upload the book for sale to sites like Amazon and B&N. I’m also the marketing person, which is a hat I’m not donning as often as I would like, because the other jobs take precedence, especially writing more stories. I’ve maintained some of the social media but the next step is promotion, which means drumming up more reviews and having giveaways. Frankly, if the book were picked up by a publisher (which I’ve never pursued), I would not be the illustrator, and I would not have to do the other jobs except for marketing. But it is gratifying to layout a book myself rather than hand it off, and to see it and the illustrations and logos look as I want them to. I am pretty self-critical so I’d say I’m pleased with the current incarnation of Risen so far. My desire is to have a book in people’s hands that they will enjoy, keep on their shelves, and which delivers a solid and entertaining story. This is why I’m not the editor. For that job, I hire, and JoSelle Vanderhooft is well-credited in steampunk, LGBT, and feminine works. RD: Where did the idea come from for this unique pair (Artifice/Dastard)? EW: Oddly enough, they are a mention, or a ‘one-off’ in my YA novel in progress, a modern speculative fiction called Wit’s World: Never Was. In it, Goth kids are known as Dark kids, and the kids of the novel happen to be members of a club called ‘The Dark Victorian Society’, where they affect gentility and enjoy works by favorite Dark authors and illustrators. I began haphazardly illustrating some aspects of Wit’s World: Never Was and the advertising poster for ‘The Dark Victorian Society’ was one of them. What kind of mythology would Goth kids like in such a poster? I came up with a ghostly Victorian woman holding a talking skull. I’m not sure how it exactly grew into Artifice, who became a Quaker strongwoman, and Jim, who became quite an animated personality. I was very frustrated with the manuscript for Wit’s World at one point and looked at my poster illustration and thought about back-story for the two. I think it was meant to be a short story, like a little tale. And then it grew and grew into the obsession it now is, and I enjoy it! RD: Your illustrations are very distinctive, where/how did you develop your craft? EW: Well, first I went to art school, earning a BFA in illustration, and developed traditional life drawing skills, there. My comic book work has several artistic influences, like Jaime Hernandez (Love and Rockets), Dan DeCarlo (Betty & Veronica), and shoujo manga (Japanese women’s comics) from the very early ’90’s. Separate from my comic book work, I did lots and lots of character drawings for traditional 2D films at Disney’s feature animation studio as an assistant animator, beginning with ‘Rescuers Down Under’ and ending at ‘Princess and the Frog’. Though I continued to hone my draftsman skills with animation work, I like to think my own work is less cartoony/caricature and more illustrative. With the Dark Victorian illustrations, I hope I can evoke some of the spirit of turn of the century illustrations, with their beautiful pen and ink women. I love the old Punch illustrations, the work of Rackham, John R. Neil, Mucha, Gibson, etc. I don’t think I can go mad with a dip pen as I’ve gotten to the point where mere line is what says it all for me, but who knows. I’ve still time to learn. RD: You produced Risen as an e-book and then a print version. What was the reason for that particular progression? EW: Since I’m self-publishing and entirely new to the process, delivering an e-book was easier than figuring out how to do print, and in that respect, fulfill the particular requirements of print-on-demand. Also, I was paying heed to some hype–‘guru’ advice–that was going about the net about a year ago; that print was dead, digital was the future, and that was what people wanted. I didn’t want to spend time making actual print books if people really didn’t want them. But the hype was utterly false and I’ll no longer pay attention to ‘experts’ or news that’s probably designed to make certain interests profit from killing print. I’ve learned that readers WANT print books. An object held in the hands is still valued above digital matter, and continues to be enjoyed more. RD: What did you do to help promote the novel release? EW: Promotion is something I’ve not done seriously. I haven’t taken the time to switch hats from creating/publishing to trotting the book out to people, meaning getting press releases sent out, soliciting reviews, doing giveaways, and so forth. Because I come from an indy comic book background, one that had its heyday in the ’90’s, my natural inclination towards promotion is: make art for the story, make accessories and stuff with my art on it, go to conventions. I think this is not the traditional author route. It’s also an odd one because the comic book world is in flux. The old comic book world is becoming a multimedia one, and here I am bringing actual novels–books with lots of words and hardly any pictures–to media conventions. It has worked for me to some degree because among the con attendees pursuing their own interests, whether it’s movies, cosplay, superhero, gaming, anime, Maker crafts like steampunk, etc, are the people who like to read. They tend to find me, so I guess I’m doing something right in terms of what’s on the table and what kinds of visuals catch their eye and make them realize: Hey! A book, and with a Victorian superheroine! RD: You attend a number of cons, what are you hoping to do when you attend a con? What have been some of your successes with attending cons? EW: I’ve ended up exhibiting at cons because that’s what I know to do. Everyone I know–who are mostly in comics, illustration, and animation–does it, so for me it’s a natural step. Again, had I been a traditional author from the get-go, this might not have been the accepted route of self-promotion. When I was making comics, first a self-published zine during the small-press explosion days, then getting published in Sarah Dyer’s Action Girl Comics and then getting my own title, Charm School, I sat behind a table or at my publisher’s booth at an event and sold my books. And as I’ve said before, everything has changed just when I’ve changed my career from a visual one to one more of words. I like writing long fiction because the stories can come out faster than drawing them. So in answer to the question, what do I hope for when doing events, I hope to reach a new audience, sell people books, and make new longtime readers because my Dark Victorian stories are really good. As to success at events, that’s all relative because each event has its quirks and can work out differently. We can’t control the state of our economy and the effect it has on people and their spending, the time of year, concurrent events going on, one’s placement inside the venue, and so forth. At one event I may sell well, at another I may not. We have to take from each event what we can learn and then figure out which kinds of events we do best at. I see every exhibitor practicing this, and despite the best laid plans or anticipations, exhibiting is always a gamble. The consistent successes at events are things like meeting new readers and introducing my books to them, seeing other creators and talking shop–that part is really important, because then you’re sharing real field experiences in story-telling, publishing, online selling, and vending–learning a new trick or two from other exhibitors, making new professional contacts, doing filmed onsite interviews or arranging for further promotion, and experiencing surprises. Some surprises you might not like, but the very good ones are what keep you going. RD: Have you learned any lessons to make your future cons a better success? EW: Boy, I’ve had to learn a few things because the nature of events, the audiences, and so forth, have changed in the past decade. I will say that what is hot one year or for two years may not be for the next year, so if one is of a genre, it’s best not to be solely dependent on that niche or gimmick but have consistently interesting and worthwhile content to offer; the more immersive the better. Give the reader a world. Not as easy as it sounds, but it can be applied across the board, whether selling crafts, clothing, jewelry, art, toys, and comic books. Gaming, of course, already fulfills this. So mine are stories, worlds provided in fiction form, and the next most simple requirement is to offer those worlds in the easiest format enjoyed by readers, and that’s physical books. RD: What is the progress on your next novel in the series? 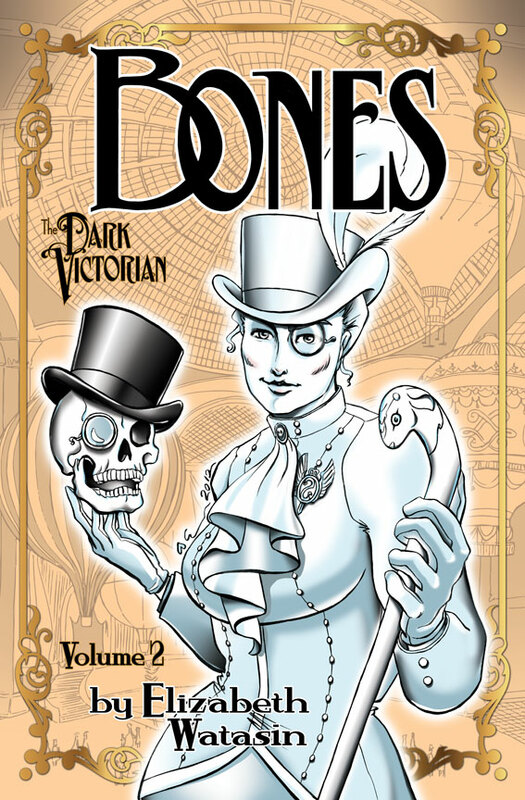 EW: As I write this, Dark Victorian: Bones, which follows the first book, Risen, is being edited and once back in my hands I’ll polish it up, do a handful of illustrations, layout the print book, and have it published and in readers’ hands by early spring. I hope for sooner but this book is significantly longer than Risen, which means more to typeset and correct. With each book I’m learning, which means perhaps a more smooth and easier process, and should lead to a consistent output of some nice solid books. RD: How many more novels are you planning for in The Dark Victorian series? EW: There’s an outline, or timeline perhaps, of about 8 books, but we’ll see if it’s that many or less, as I’m wondering if one theme I wanted to tackle is even necessary, and whether a subplot becomes its own book. However it works out, I’ve the vision and direction down, with all kinds of supernatural themes and horrific foes along the way. RD: Outside of this series, what other projects are you working on? EW: There are several projects stewing, one of which is finishing the YA novel, Wit’s World: Never Was, which is about a girl from a magician’s family who loses her twin in a duplicate dimension’s theme park, and goes there to rescue her. There are quite a few readers waiting for that book. Just as The Dark Victorian was an offshoot of Wit’s World, I have Fey Dently, Vampyre, meant as a series of storybooks, which also comes from Wit’s World. 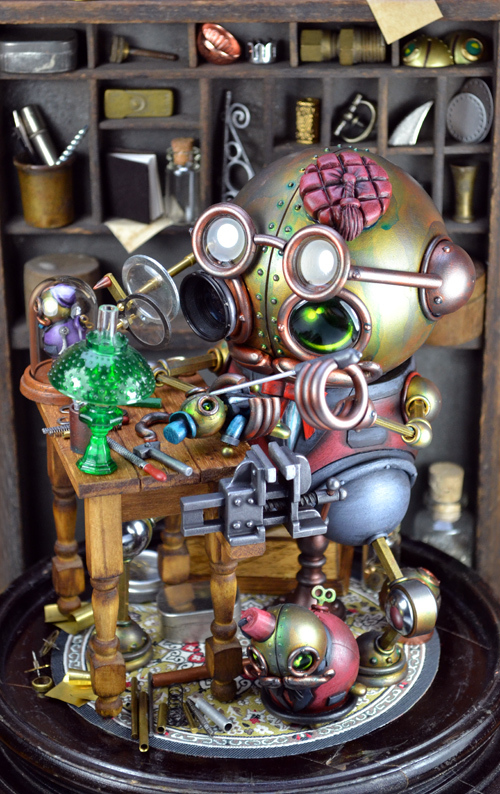 Fey Dently is an automaton–in Wit’s World’s vernacular, a ‘Puppetron’–who lives in a section of the Wit’s World park called Darque Towne. The storybooks are of her adventures and would be in the macabre vein of Edward Gorey. Then I have the Charm School Collection to put together, wrap up (I’ve about 26 more comic book pages to draw), and publish. Charm School is about a cute witch, dragster vampire, and femme fatale dark fairy set in a 50’s style mixed with fairytale-style town called Little Salem, sitting on the edge of the twilight world. And to top all this work off, I thought to do a Dark Victorian short story, which, at the suggestion of my beta-reader, I could base on many of the secondary characters who met untimely ends in Bones. But instead I center Sundark, the short in progress, on a new set of secondary characters, Mrs. Elle Black and her wife Mrs. Faedra White-Black, Elle being a woman gifted with the ability to see what we call ‘ghosts’ and to move objects with her mind. In Sundark, she must solve why guests are disappearing in a mechanical hotel. I’m really enjoying writing this story!